I am posting this as my process-documentation …. Inverted Tatting – Inverted Learning ! In early 2014, I was so impressed by Judith Connors’ exquisite 3-D flowers & compositions with inverted tatting, that I plunged right in. And plunged in the deep end ! Went straight for 3-D tatting. I would start a piece, reach midways, then wouldn’t know how to proceed because the thread had a mind of it’s own ! Drowning, & obviously frustrated, I discontinued the exercise, promising myself to get more techniques, skills & practice under my belt, before taking it up again. I had shared these on InTatters at the time, but the pic quality was bad; hence have re-photographed them …. So first off, here’s what I made then, sometime in March 2014. Revisiting after One year ! So here are my latest ( I did not attempt the Damselfly, simply played around). Again, not good, but I can see my own slight improvement with a few do’s & don’ts for future practice (that are shared below, some of which were instructions by Judith herself) & definitely something I can go back to repeatedly, trying new shapes, etc. till I really improve. Use fine thread, preferably perle cotton. The variegated green, and the brown were in Anchor size 20 (last year), & latest white are in size 40. Unfortunately, no perle cotton. Start with simple, equidistant , equi-length picots. It is easier to come back & join as in a mirror-image. Lock join should be Tight ! Gives a neater, even, more pleasing look. Gradually increase the number of LJs in a single picot. I have made a few with 2 joins in the white paisley. Tension is Crucial. Lots of practice required there. Do not tug/snug the stitches too much ! My mistake in initial attempts, in order to convert to 3-D, was to really tug at the chain. It just ends up distorting the whole piece !!! Do not take extreme close-ups Until you have good pieces to show, lol ! I will add these & more resources to my Tatting Resources page, as I come across them in future. What is Your favorite tutorial & tip for Inverted Tatting ? That’s it for the present. As you can well see, I need tons of practice here ! My first diagram & free pdf ! My bridge to the visual vista has broken ! To put it bit more mildly, have got myself some kind of allergic reaction on the bridge of my nose, along the very strip where the reading glasses rest. Who knows, maybe my long pleasant hours on Inkscape took their toll in this manner - hooked on one, hooked by another ?! Small price to pay, even if it is so ;-P Because I am so incredibly happy with my trials & so excited to share my very first pdf with a proper diagram. My First Diagram & pdf Pattern! I will update the post (more pics here) & Pattern Page as well. I have included both the written instructions/pattern, as well as a notated diagram. Please let me know if the link works. Any other feedback will be greatly appreciated too. I had a tremendous journey trying to diagram on Inkscape, & as I have often said, it was Robin’s explicit tutorial series, here, that got me through ! I had dabbled in the software earlier, downloading a couple of tutorials & doing a bit of practice. But the software was huge/vast, daunting, seemingly moody/erratic, …. Robin broke it all down so neatly, stitching it to our specific needs as a tatter, that it became pretty easy to follow & apply. I also realized that some of the ‘rules’ are pretty universal & basic. Once you understand that, one can extrapolate & apply to other commands & tools within that software. One doesn’t need to go back to the drawing board for each new step then. It becomes easy to figure stuff out, since what applies to one tool, will also apply to the others in some basic measure. What I did do, however, was make a separate file with each stage of drawing saved in it, while my ‘working file’ was different. This way, I could go back to any stage at any time. Kind of like a template for the particular diagram. Thank you, Robin, for All your help ! Will be out of circulation for the next couple of days, till it all heals for good. I’ve been neglecting it for these last few days, except for occasional applications, … so now I have to sit back & do nothing but home chores. Torture comes in many different forms ! Thus, productively inching closer towards the pdfs as resolved . On the tatting front, have been watching Karen Cabrera’s videos (list of all her tuts) & trying my hand at some stuff – just little doodles. I used to dislike videos because I needed extra concentration to overcome the tatting style, the basic stitch formation, the hand/thread movement, as well as the long nails (I am continually amazed at how quick & flawless the tatting is, despite the long nails – shows the level of accomplishment & skill). Anyways, as I watched the videos, I suddenly realized that that Extra effort to blot out certain movements was no longer required ! I had conquered my own limitations & could Easily focus on the new technique being demonstrated. Who said practice does not count – be it viewing or doing ?! This was merely something I was doing with 2 scrap threads, no design/pattern in mind. After making the central 2-coloured ring, I continued on with an outer round of chains only, joining with a Slope & Roll join at every segment, & switching colours. It kind of gives a Celtic feel to the uni-dimensional structure, I think. Another fun finding : if I finger the brown rings, they convert into 3-D, & the turtle comes to life & walks away !!! I have another, more elaborate pattern in the works (half-done). Will share eventually. At present, too immersed in learning exercises, etc. Oh, I Love the effect of this technique demonstrated in Lesson 131 (Please watch video till the end, for the Gorgeous effects). I wanted to have at least 6-8 wraps (“rounds”) per ‘picot’, so that it got the bullion stitch look; but the size 10 thread proved to be damper – it kept untwisting. So had to be satisfied with 4 wraps. This technique will Definitely go into my future tatting. This is for the curlicue (blue, in above composition) , and don’t you just love the possibilities for freeform tatting using this technique ! When I first tried to make the curlicues using long chains, in this Coiled Comfort bookmark here, I was left with the problem of either cutting after each chain or finding ‘loopholes’ to continue without cutting every time. If I’d known of this technique, the tatting would’ve been a breeze, And much more satisfying & elegant. Although Karen starts with a ring & continues with the SSSCh, I started with a tiny space of thread held in a clip & did a Lock Stitch while simultaneously tugging at the core thread. This locks the start, & one can continue with the chain. However, the stitches are Reverse Stitches, in Reverse Order (ie. unflipped, & 2nd half stitch first). This technique is also known as Floral Picots by Ring of Tatters, here . I had learned & applied it last year in my Tiny Heart Poppy . The pink flower in the above doodle has these picots, giving a layered effect. If one makes each alternate picot larger , then one can get a clear 2-layered ring of picots as in flowers !!! There are many more picot styles/techniques on her videos, that I have watched. Have still to get down to actually doodling. Thank you, Karen, for all the wonderful techniques you have uploaded !!! And before I take your leave, here is Carrie Neahring’s pdf download link for her Aislyn’s Bookmark. I will update the post, as well. Do take a look at her bookmark – adorable colours & gorgeous tassel ! Hope you enjoy making it :-) She has uploaded it on Craftree here, & kindly accepted to share it through my blog as well, for anybody interested. Tatting Away XIII : end, upend, no end ?! Questions ! I. What is it ?! A pair of Peacock feathers ? Lord Krishna’s Bansuri (flute) ? II. What comes first ? The cart or the horse ? The tail or the body ? But on a more serious note, when tatting a bookmark, which side/end would You normally start with ? Body, you answer ? Well, I have, so far, always started with the main body, & Then added a tail, tassel, charm, …. I had tatted Jane Eborall’s Shuttle Shaped Motifs that I spoke about here – one complete & the other partial. What should I do with them was my concern, because the former was a bit large to glue on to my shuttle. Decided that Both of them would act as charms at the end of bookmark tail. Thus began my hunt for a 2-colour pattern . After browsing through my pinterest board, , I settled on this Spiral Bookmark I’d wanted to try ever since setting eyes on it. Spiral Bookmark by Regina ‘Gina’ Brummet adapted from edging #1, page 23 in Tatting Doilies & Edgings, Dover Press, edited by Rita Weiss. (I have the book, but the pattern is now linked in Craftree, here, through keep&share). SLT (shoelace trick) is a must each time the colours are switched. I did directional (modern) tatting, hence everything was tatted from the front/right side. I did not need to Reverse Work at any stage. It was a bit messy while working up one side, but once the other side started to join up, it all came along nicely. Must read/skim through the Entire instructions/pattern carefully before starting the actual process of tatting ! I missed the turning chain part & had to unravel 2 closed rings. Needed to increase the stitchcount at both ends. I Googled Images & most of the versions had in fact increased the chain length by one repeat at least. The reason I was really excited earlier, was this gorgeous Candle pattern that emerges when the motifs are placed on top, acting as a flame ! (first picture on the very top) The best part is that both the flames & the candle can be tatted in one pass . The shuttle motifs also work well as a peacock feather (mayurpankh) for Lord Krishna’s crown & flute ! You can see, I thoroughly enjoyed this entire experience, playing around with the pieces. My sincere thanks to the designers for sharing their patterns. III. Can you identify this tatting technique ? To give you a couple of clues : It is done with 2 shuttles & in 2 rounds. It is not a given pattern, I just went along while learning the technique & going with the colours in each shuttle. With a little bit of tweaking, these look like Two Intertwined Hearts. The best laid plans !!! Instead, I finally tatted another heart last evening, this time from my original sketches which were drawn when Land of Laces announced the Heart Challenge here ! Even though it did not Strictly conform to the sketch, the main element viz. a braid of Interlocking Rings is there. The rest I tatted as I went, but with some meaning in each segment. Sharing the free pattern … hope you like it. The Interlocking Rings can be replaced with Split Rings, where the colours of each half alternate, creating a spiraling rope-like effect as in the tail of my Trailing Hearts Bookmark here . Measurement : Works up to around 2 inches in size 40 thread. I have written the pattern as per the segments for greater clarity, hopefully. Refer to image this with notations. Wind 2 pairs of shuttles, each pair with one colour, CTM. With purple shuttles -- SR1 : 10 / vsp 10 . Cl. With white shuttles -- SR2 : 10 / vsp 10 . Before closing, pass both purple shuttles UPWARDS through the white ring. Close ring. Repeat these two SRs, alternating the colours, and WITHOUT the picot, such that a segment of 10 IRs is formed. Continuing with the white shuttle pair, make a LCh 1½” long. With purple shuttles, make another LCh 1½” long. Twist the 2 together & to keep the twist in place lock/knot them with a ds. While twisting, keep the arc of the heart in mind – the twist should be just right. With white pair -- Ch : vsp, 2, 8 lp sep by 1 ds, 2, join to vsp. This gives a ring-like effect. With purple pair –- Ch: vsp, 2, 6 lp sep by 2 ds, 2, LJ to 3rd picot of white chain, RW, 25 ds. For this segment, pair one white shuttle with purple each. With one pair of shuttles make Inner Lock Chain measuring 1½”. LJ to vsp of 1st white SR on the IR segment. With the other pair of shuttles, make Outer Lock Chain measuring 2”. LJ to vsp of 1st purple SR on the IR segment. With white pair of shuttles together : Ch : 3, 7 lp sep by 1 ds, 3, LJ to any ds of 1st white SR in IR segment. With purple pair of shuttles together : Ch : approx 30 ds. LJ to last picot of white chain. Tie & cut all threads. Hide ends. 4 shuttles can be a bit tricky to work with while making the IRs, but they were a JOY to create the rest of the elements – one had so much Choice ! Just pick up any shuttle to work with. And I didn’t even do any encapsulation here, sticking to 2-shuttle tatting for the rest of the pattern ! I chose a finer thread (size 40) to give it a more elegant, dainty look. If I make this again, I will try to have larger SRs in Segment 1. Maybe 15/15. This will give a more rounded look – closer to heart shapes. I have given the LCh lengths. But with different tensions, etc. this length may vary for individuals. Try to estimate the desired length by positioning the in-work chain Before joining . I think the Segment 4 LChs should be a tad longer. Seemed fine last night, but appear a bit short when scanning. The last Segment #5 is Optional because the heart shape has already been formed. I just wanted to show some symbolism here. A little blocking is required … I just spritz some water & ironed. I had quite a struggle with the starting of the IRs. 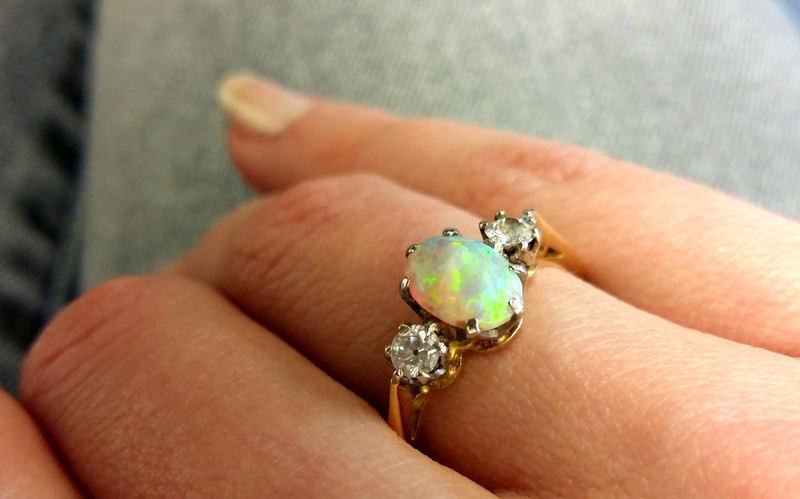 But once the initial rings are made, it is easy going. If anybody wishes for a step-by-step pictorial on how to start Interlocking Rings, a là Interlaced Rings here, please leave a comment letting me know. I took up Dorothea’s Land of Laces Heart Challenge here (click on link for details) & that is how the Trailing Hearts Pattern arose. But even that pattern was Not on my initial sketches. Anyways, the challenge is just an excuse. It served as a good diving board & I am getting more comfortable creating these tiny motifs/medallions/shapes. Hope you appreciate the patterns … please do leave feedback so that I can improve & become better …. Measurements :1-1/2 " wide x 1 " vertically ... round 1. 2-3/4" x 1-1/2" vertically .... round 2. 2 shuttles, wound CTM . Refer to images for sequence of working, indicated by numbered rings. R2 : 9 p sep by 1 ds. Alternate p & lp, starting with lp. Cl . Fp. 6 sp 1 . Cl SCMR . R3 : 1 + (SCMR1) 5 sp 6. Cl. RW. Ch : 5 p 5 p 5 p 5 p 5 p 5 . RW. R4 : 5 + (R3) 4 sp 1 . Cl. 5 sp 1 . Cl SCMR. R7 : 1 + (SCMR5) 4 p 5 . Cl. RW. R8 : 6 + (R7) 5 p 1 . Cl. SCMR9 : 1 + (R8) 6 + (R2) 7 . Cl. Round 1 complete. Tie & Cut ONLY one shuttle thread & hide it in the next ring, as it is being made, since the next round is rings-only round. Round 2. Working clockwise …. Half Ring/Scallop : 5 Close partially such that a scallop is formed. LJ to picot on chain. Repeat this all around the chains, joining with LJ at each p, such that 12 half rings/scallops are made. Tie and cut. Hide cut end. I deliberately used half rings with the tiny bit of bare thread at their base in Round 2 . The knotted side makes a scalloped edge, while the bare thread gives a lacy, vintage effect. Hence the name ... a timeless heart that incorporates traditional/classic elements with more modern tatting such as self-closing mock rings. And hence, too, the choice of thread & colour …. lending it a kind of old-world look. Derived from the "Magic Square", as outlined in this post here (Fig. 5A) . This is such a small & simple heart that it can be made with leftover yarn (as I did for this prototype….didn’t get around to making a better version yet). It can easily be a beginner’s pattern. Abbreviations : As listed above. and JK : Josephine Knot. Ch : 5. Join to base of R1 or the space between R1 & first Ch. i) Before closing R1, a very small picot can be incorporated in order to anchor the last chain join. ii) All chains can be worked with directional tatting. iii) Since the 2nd shuttle is required only for the tiny JK, one can do without it …. Simply finger tat this last piece, or make an SLT & single shuttle JK. The advantage with this pattern is that it can be Easily needle-tatted too ! At this stage, I realized that I hadn’t completely thought this through. So, I simply finger-tatted the last interlocking ring. Tie & cut. Hide ends. To avoid this step, cut the chain thread & hide end in last ring, & make the last ring a single shuttle split ring (SSSR) ! That’s it for now. I am also working on another tiny pattern … Hope I get it right in time to share . Jane has been sharing these coasters in quick succession, through the last few weeks. Each one had a singular identity with the choice of colourway, tempting me enormously ;-) Since I had recently landed myself with 5 balls of size 10 thread (the size was not mentioned on ebay, only the Gorgeous pic of 5 colourways), this coaster/mini-doily seemed a very good starting project, just the right size when completed. And am I glad to have chosen this, coz it truly turned into a learning experience. It starts with an SCMR !!! I always start my tatting without knots, whatever be the first element. But how was I to Start the 2-colour SCMR Without knots !!! Stumped at the very first step ;-/ . I Knew it could be done in a similar manner to how I start all my other tatting elements. But it was too fiddly & I was too lazy to work it out for myself. So turned to Jane & and sure enough she has a clear Tips & Techniques download for “Starting Rings, Chains, SR’s & SCMR’s without tying any knots” . Easy-peasy !!! This coaster now livens up my dining table, as you can see - almost custom-made for the vase !!! Bliss, India. Variegated thread (no colourway, dye details or size mentioned). Probably a size 10. South Maid Mercer Cotton, USA . Art. D-54, Color 430, Cream. Size 10. · Since I loaded Shuttle 1 with variegated thread, the pattern needs to be started using Shuttle 2. · The thread sizes were a bit off in comparison with each other, with the plain colour slightly finer. Also, the South Maid thread seemed thinner at places, if that wasn’t my imagination. The Bliss thread was wonderful to work with. Unraveling needed care, though, due to slightly less taut twist. · Variegated thread (Sh1) needed 4 full-bobbin refills while plain thread (Sh2) required only 2 full refills. 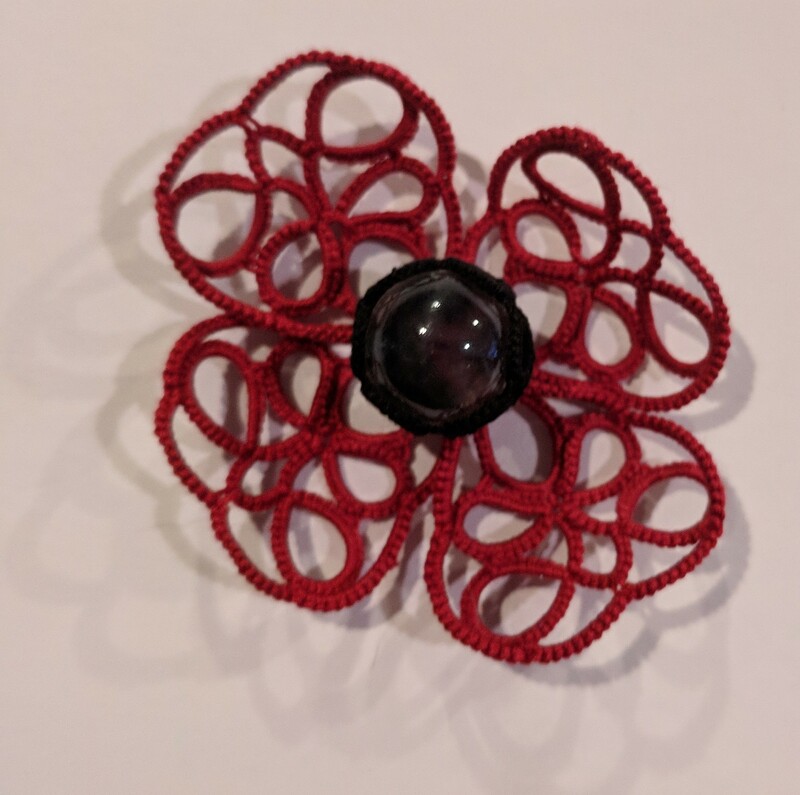 · Learned how to start 2-colour tatting with an SCMR with Jane’s tut here. · The pattern is a tad confusing at initial stages, despite clear diagrams – I needed all my spatial perspective at command; I sometimes feel disoriented with all what goes where in case of split rings & SCMRs ! But now I am quite familiar with SCMRs – good practice ! During last year’s TIAS (the sailing boat), I learned how to make Split Rings here. For greater practice & understanding, I simultaneously chose to tat the Fandango Coaster pattern & the Fandango Square Motif. I liked the pattern very much & I did end up with a few initial mistakes, especially with regard to Orientation. The practice helped a lot & in the process I got myself 2 glass/mug coasters ! Done in Anchor Mercer size 20 threads. Recently, Jane posted a pic of her Shuttle Shaped Motif, here. When looking at it, I was stumped by what looked like a picot emerging from picots !!! Well, I Had to try out the pattern (she has reinstated the pattern here. And here are the 2 motifs – one complete, the other with only the 1st round completed. I intend to use them as is …. Will share soon. Many thanks to Jane for sharing so selflessly ! I have posted progress pictures of Days 1 - 6 here , & Days 7 - 8 here . Now for the rest, along with a compiled bird’s-eye view of all 13 days . I used to think that Lock Chain was a very nice decorative element in tatting. Now I realize that it is also a Straight chain ! Unlike normal double stitch chains which tend to curve, a LCh does not curve at all. Hence it is a design element for a straight line. The only drawback, at times, can be that if working with 2 colours, both colours will show up on the chain even if you want the straight chain in one colour only. Ne'er from a craft far . Cutting smartly is it's bane. And make a very wrong snip. C'mon tatters, cut it some slack ! If scissors do not cut the thread?! Helping away when troubles befall. Now that Jane has posted pics of her own tatted scissors here , I cannot help wondering why most of us did not get the cutting edge as straight as Jane’s ? Should the Lock Chain have been looser ? Should we have added 1 ds more to our tatting ? Or was it the very small end rings that played mischief ?! Any answers ? Any tips ? Many thanks to Jane Eborall for All her tremendous work & effort in sharing patterns, techniques, & processes. And this start-of-the-year fun game. What else but hearts, this close to St Valentine’s Day ? I started this as part of Dorothea’s Land of Laces Heart Challenge. (click on link to her site & challenge). Sharing patterns for a pair of earrings & a bookmark. However, this is not the end of the application …. Using the single heart or the heart column, one can create motifs, insertions, crosses, pendants, & so on, all in one pass. The heart(s) can trail one behind the other or be at right angles to each other or at 180° ie. opposite-facing. For some fascinating examples, this post might come in handy. For the tip of single heart/end heart, an SCMR is used, but this is optional & can be substituted with a normal ring, a large bead, a double picot, …..as desired. A single colour thread can be used. I used 2 colours in order to highlight the heart shaped outline. UPDATE : The pattern can now be downloaded directly. Click on the title above for pdf. My first attempt at making earrings. I haven’t been able to read up on tutorials yet, so the earring hook insertion may require some learning & experience. Anchor Mercer Crochet Cotton. Size 20. Less than 1.5 m or yards of each thread is required for 2 earrings (only about 52 inches). If you prefer FS/BS tatting, then only the 1st R-A needs to be done in FS/BS. First add a bead to the Sh2 or red thread. If not using bead, then substitute with picot in pattern. Ch : 17 . Join to base of ring A.
Insert the earring hook. Tie & cut. Hide ends. Make a 2nd pair & you are ready to dress up your ears for the big day (or gift it). 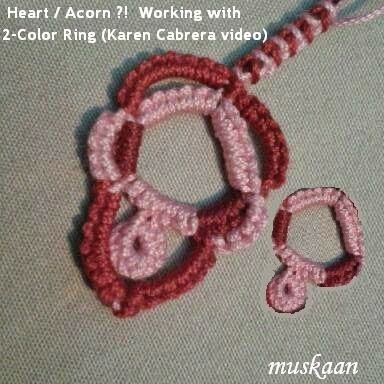 For Pendant, make a 3rd heart & substitute hook with ring . The heart pattern Actually started as a way to overcame a logistical hurdle of how to create hearts trailing one behind the other, all in one pass, to make an all-hearts bookmark. I should’ve used brighter colours … maybe next time. Approx. 6½m or 7.2 yards in shuttle 1 & 5.6m or 6 yards in shuttle 2 for bookmark only. But with 2 full bobbins, you can easily make 1 bookmark & 1 or 2 separate individual hearts/ a pair of earrings. For the very 1st heart Only, after making closing R1, make a very very small picot before starting the 15 chain. 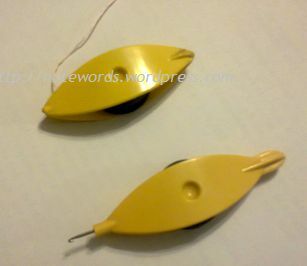 I have indicated this with a U-pin inserted through that vvsp, as seen in adjoining pic. However, this vvsp is Optional, as one can join to the base of the ring later. Each heart in the bookmark is basically made up of repeats of the heart pattern . Each heart consists of a sequence of normal ring (R-A), long arched chain, split ring (SR-B), short chain , repeated to desired length …. Then return back with an SCMR, split ring (SR-C), & long arched chain joined to base of R-A, short chain, SR-C & so on till we reach back to the 1st heart & join the chain to the base of R-A or to the very very small picot. Thus this sequence is ‘split vertically’ in order to make a column of hearts in one pass, returning to complete the missing half (viz. short chain, SR3 & long chain). Then one continues to make the tail & the single heart charm. Note : The diagram shows only 2 hearts - the 1st & last. However, repeat the pattern for as many times as desired Between these 2 end hearts . Repeat from ** to ** 5 more times, to make 6 half hearts in a column. R-A : 5 sp 3 p 3 sp 5 Cl. This completes one vertical half of the column & we now return back up to complete the half-tatted hearts. Continue from *** to *** till you reach the very 1st heart. For the 1st heart, after making Ch 15, join to the vvsp at base of starting chain or if you have omitted this vvsp, then join to base of R-A. Tail comprises of 2-coloured Split Rings, with the colours alternating in each half, to give a spiral, intertwined effect. Each SR is 4 / 4 . SS , SLT . Repeat for required length. Note : After each SR, Switch Shuttles, make a SLT (or simply an unflipped half stitch), & start next SR. Be sure to make this unflipped half stitch using the switched shuttle, to give a consistent effect. Continue for desired length, alternating the shuttles after each ring. Ch : 15 . Join to base of R-A. Tie & cut ends & hide. Again, the instructions seem lengthier & more complex than the actual tatting. I have diagrammed both patterns, & will convert to pdf, with proper diagramming in a few months time. Game for a Necklace or Bracelet to go with the earrings ?? ?